Cyclodextrins (CDs) are linked sugars that form in a way that leaves an open cavity, generally as a ring—chemists have found various ways to fill the cavities with other useful molecules, which often allows them to bind to small hydrophobic molecules. Once bound, they become trapped, making the CDs soluble. Each of the rings has its own name depending on the number of sugars, such as octamers or hexamers. Pharmaceutical and other chemical companies have exploited CDs to make a wide variety of consumer products and medicines. CDs in common use are typically made from six to eight sugars, but chemists would like to make new products that use smaller rings with just three or four sugars (CD3 and CD4). Unfortunately, there has not been a way to create such small cyclodextrins until now. 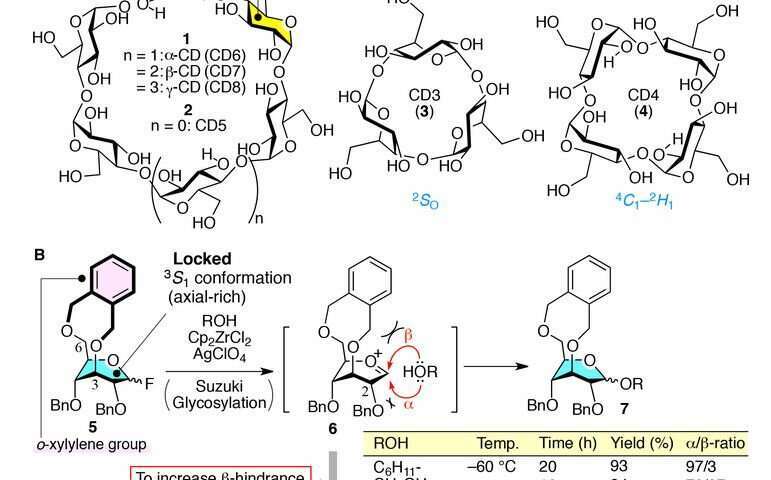 In this new effort, the researchers in Japan found a way to solve the problems that other researchers encountered, revealing how to create new products based on small cyclodextrins. To create the small cyclodextrins, the researchers used linkers to create building blocks. The building blocks served to alter the sugar conformation—more specifically, the linkers pushed the monomers into having a balanced preference between multiple possible shapes. This behavior is called suppleness. The researchers forced suppleness by physically connecting each linker with two of the sugar alcohol groups, which resulted in the creation of another ring. That allowed the team to overcome the high strain between the bonds that held the sugars together—a problem that has prevented their creation in the past. Cyclodextrins are mainly used to make drugs, but other applications have included agriculture products and environmental engineering. Their popularity is mostly attributable to their safety—they are all non-toxic. Because of their history, it is likely that the new, smaller cyclodextrins will be used in similar applications.